There is no more important investment that we can make as a society than in education. The scholars of today will be the leaders of tomorrow, and ensuring that they are prepared for that experience is crucial if Colorado and our nation are to continue to thrive. 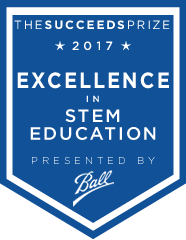 It is in that spirit that we’d like to recognize the finalists for The Succeeds Prize Excellence in STEM Education. The Succeeds Prize is the most prestigious awards and recognition event for Colorado’s public schools and educators. It honors Colorado’s public schools and educators that are making a meaningful difference in the lives of their students. It also serves as a year-long campaign to implement and scale successful innovations and practices statewide, so every student in Colorado can benefit. Bristol Elementary School in Colorado Springs believes attitude, alignment, and accountability are the keys to its success. Faculty members strive to develop strong relationship with students while establishing and maintaining high expectations. Data is regularly reviewed and learning opportunities adjusted to ensure all students are growing. Bristol also places a strong emphasis on reading instruction and boasts a new STEAM program for its students. Denver School of Science and Technology: Byers Middle School sees STEM education through a vital equity lens and encourages that all of its students study STEM curriculum. The school places strong value on the real-world, entrepreneurial skills taught through STEM, such as failing fast and taking risks. Additionally, educator professional development and team collaboration are prioritized, as are strong relationships with students and families. Strawberry Park Elementary School balances the region’s tradition and history with preparing students to excel in an ultra-competitive, global society. Teaching to the whole student, the school encourages students to take ownership of their learning, and it incorporates tasks that help prepare students to succeed in the 21st century. Additionally, the school’s faculty embody and model the traits they seek to instill in students, such as lifelong learning, embracing change, and perseverance. We are excited to provide this sneak peak of what makes our Elementary School finalists special so we can identify opportunities to replicate it and share these successes with schools throughout the state. We hope you will join the members of Colorado Succeeds, as well as our partners at mindSpark Learning and 9News, in congratulating these schools.